The Persian Gulf harbors an array of extremely compromising secrets. Near the top is the Afghan heroin ratline – with the United Arab Emirates (UAE) positioned as the golden node of a transnational, trillion dollar heroin money laundering operation. In this 21st century Opium War, crops harvested in Afghanistan are essentially feeding the heroin market not only in Russia and Iran but especially in the US. Up to 93% of the world’s opium comes from Afghanistan. Contrary to predominant Western perception, this is not an Afghan Taliban operation. The key questions — never asked by Atlanticist circles — are who buys the opium harvests; refines them into heroin; controls the export routes; and then sell them for humongous profit compared to what the Taliban have locally imposed in taxes. The hegemonic narrative rules that Washington bombed Afghanistan in 2001 in “self-defense” after 9/11; installed a “democratic” government; and after 16 years never de facto left because this is a key node in the Global War on Terror (GWOT), against al-Qaeda and the Taliban alike. Washington spent over $100 billion in Afghan reconstruction. And, allegedly, $8.4 billion in “counternarcotics programs”. Operation Enduring Freedom — along with the “liberation” of Iraq — have cost an astonishing several trillion dollars. And still the heroin ratline, out of occupied Afghanistan, thrives. Cui bono? Another exhaustive report issued by the delightful acronym SIGAR (Special Inspector General for Afghanistan Reconstruction) even hints — discreetly — at the crucial connection; Operation Enduring Freedom feeding America’s heroin epidemic. Afghanistan is infested by contractors; numbers vary from 10,000 to tens of thousands. Military and ex-military alike can be reasonably pinpointed as players in the heroin ratline — in many cases for personal profit. But the clincher concerns the financing of US intel black ops that should not by any means come under scrutiny by the US Congress. “This was about 2011. He said he gave US Army Intelligence and the CIA reports on the Afghan heroin trade — that US military convoys from the ports of Pakistan were being used to ship the heroin out of Afghanistan — much of it was raw opium — for distribution as their backhaul. None of this deviates from the CIA’s modus operandi. Past examples abound. 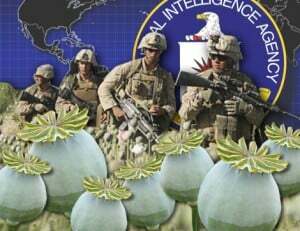 The most notorious concerns the Golden Triangle during the Vietnam war, when the CIA imposed a food-for-opium scheme on Hmong tribesmen from Laos — complete with a heroin refinery at the CIA headquarters in northern Laos and the set up of nefarious Air America to export the opium. The whole story was exposed on Prof. Alfred McCoy‘s seminal The Politics of Heroin in Southeast Asia — which drove Langley nuts. A contemporary counterpart would be a recent book by Italian journalist Enrico Piovesana detailing the New Opium War in Afghanistan. A Pakistani intel source with vast Pashtun/ tribal area contacts delves into even more incendiary territory; “According to our best information the CIA has brought in their al-Qaeda-Daesh proxies into Afghanistan to justify the additional American troops”. That would neatly tie in with Trump being cornered by his generals. It does not get more serious than that; Moscow denouncing sectors of the US-trained Afghan Armed Forces side by side with NATO engaged in covert ops supporting jihadis. Russian intel has hinted — discreetly — for quite some time that US intel is covertly sponsoring Daesh — a.k.a. “ISIS Khorasan” — in Afghanistan. Russian intel is very much aware of the Afghan chapter in the New Great Game. Russian citizens are “collateral damage” of the Afghan heroin ratline as much as Americans. The Russian Foreign Ministry is tracking how tons of chemicals are being illegally imported into Afghanistan from, among others, “Italy, France and the Netherlands”, and how the US and NATO are doing absolutely nothing to contain the heroin ratline. Well, Air America, after all, never died. It just relocated from the jungles of Southeast Asia to the arid crossroads of Central and South Asia.